Caution, barium compounds are toxic! Safety goggles! A large test tube is filled to about 2 cm high with adipic acid and a spatula-tipful of barium hydroxide is then added. By shaking carefully the substances become coarsely mixed. One clamps the thus filled test tube obliquely to the stand, applies the rubber plug with the discharge tube, and allows this to penetrate about halfway into the small test tube, which has been placed into a beaker (perhaps filled with cold water or ice). One places the burner, which has been set to a middle flame, under the test tube with the distillation mixture. The latter soon then melts to an at first colorless but cloudy liquid, and then slowly becomes darker. Evaporating adipic acid forms a white trace a couple of centimeters higher up the glass tube, while at the same time a colorless, clear liquid soon begins to distill and collect in the apparatus. One distills until almost fully dry, something which can take several minutes. A little brown residue is left over. After one has extinguished the burner one removes the receptacle. About half of the volume of the adipic acid has accumulated in the form of a perfectly clear, colorless liquid. The hereby derived cyclopentanone exhibits a typical, not unpleasant odor, which is very similiar to that of cyclohexanone. One can use the distillate to investigate its properties and to demonstrate the typical reactions of ketones. Otherwise it can be disposed of as halogene-free organic waste. The barium containing-distillation residue is difficult to remove. It is best to dispose of the entire test tube as solid, heavy metal waste. As can be seen from the above formula row, 2-cyclopentancarboxylic acid is produced from adipic acid via ester condensation. This is, as is typical for ß-keto acids, very susceptible to the loss of carbon dioxide. To be precise, it is the respective barium salt which, of course, reacts under the chosen reaction conditions. That the ester condensation does not lead to polymers is easily explained by the fact that on the one hand a particularly stable five-membered ring is formed by the intramolecular reaction and on the other that the involved atoms necessarily (favorably) lie close to one another in the intramolecular reaction. One compares this with the behavior of other dicarboxylic acids. 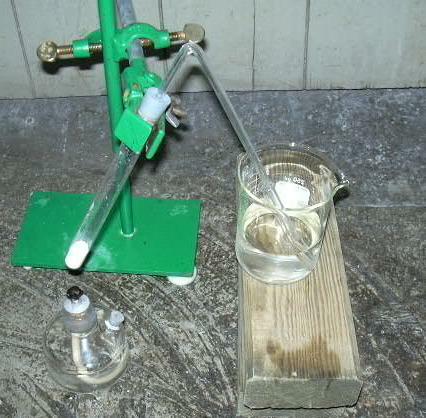 Experimental apparatus before begin of the reaction. Adaptation of a macro synthesis from Houben-Weyl (exact description momentarily not available).